The following is a guest blog post by Bahaneh Hobel, a partner in the Alcohol Beverage and Wine Law groups at Dickenson Peatman & Fogarty in Napa. Bahaneh’s practice focuses exclusively on all aspects of alcohol beverage law and regulation for wineries, breweries, distilled spirits plants, importers, wholesalers, and retailers. Many of us have attended “passport events” where you buy a glass, wrist band, or passport that gets you access to wine tastings at various locations and often include a party at a central event location. These “event passports” are often sold by marketing agencies or winegrower associations promoting the event. But these marketing or supplier organizations selling the tickets or passports don’t generally have licenses from the California Department of Alcoholic Beverage Control (ABC). So, how can they do it? And what happens when multiple wineries participate or pour at an event at one location? The marketing organization or winegrower association is only marketing the event, which is actually put on by the participating wineries. 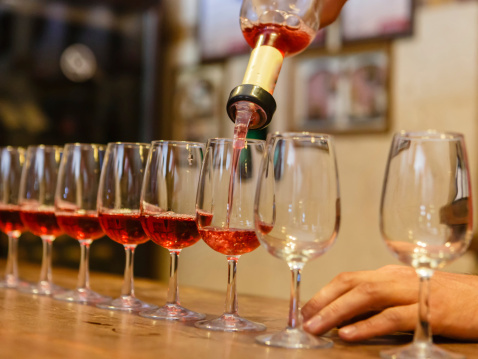 The organization sells only access to the experiences or activities that the licensed wineries may lawfully provide free of charge to consumers (such as tastings). The participating wineries are just providing tastes of wine as permitted under their licenses (which allow them to give or sell such tastes). If a winery provides anything more than a tasting to consumers on its premises, a license will be required. There’s no commingling of funds or sharing of revenue between the marketing organization and the licensed wineries (i.e., all passport sales proceeds go to the organization, and revenue from sales of alcoholic beverages apart from the tastes given during the event aren’t shared with the marketing organization). If the event doesn’t meet all four of these requirements, the marketing company or association will need a license. For example, passport events that include a gala dinner or tasting event where wines from multiple wineries are being poured at one location (rather than wineries pouring at their own locations) will require a temporary daily license held by the event organizer. A temporary daily license also will be required when the tickets being sold by the organization include alcohol (in excess of the “tastings” permitted at a licensed manufacturer’s premises under the ABC Act). These requirements may effectively cut some organizations out of putting on passport events because they aren’t eligible for temporary daily licenses, which are typically limited to nonprofit or other charitable organizations. Event organizers should always contact counsel or the ABC to determine whether a license is required, and if so, if it’s even available. Hear from me and many other experts on the pressing issues currently facing the wine industry at CEB’s Wine Law Forum™ 2016 on November 3-4 in Santa Barbara.